My brother and I formed Shredded Productions LLC in 2004 in order to produce and sell a Hip Hop Street Racing DVD entitled Motor City Local. My role was creating all of the print design, authoring the DVD and creating the television commercial. 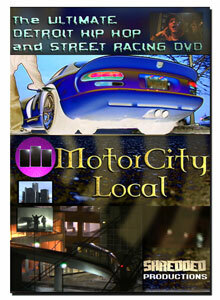 While creating Motor City Local, we also produced a jettared music video, and a promotional video for Bad Seed Clothing. Click on the image below to see the spot I created for a TV campaign we ran in January 2005.
from the Shredded Productions website.